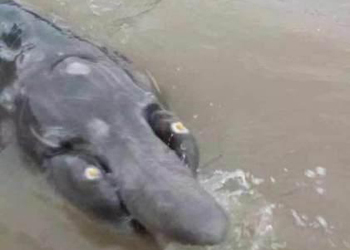 A group of Chinese fishermen were understandably shocked when they hauled in a bizarre creature that looked like a cross between a crocodile and a dolphin. 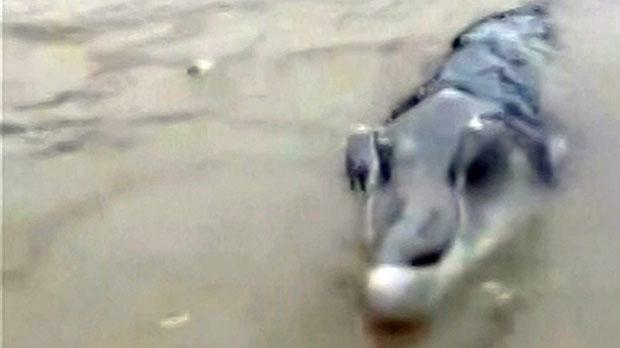 The ‘Crocodolphin’ as it was quickly (and brilliantly) named was caught in waters just off Zhoushan, a town in the Zhejiang Province of China, reports The Telegraph. The unknown monster fish came as a surprise to the onlookers and left the fishermen stunned as none of the group had ever seen anything like the strange creature before. However, before we get too excited and start scrabbling to identify it as a new species, it turns out that – although extremely rare – we do in fact know what it is. According to marine experts it is actually a type of ‘beaked whale’ which are very rarely seen as they are among the deepest diving whales. They regularly spend over an hour at depths over 1,000 metres and pass the majority of their time hanging out close to the ocean floor. The experts also pointed out that although it may look extremely odd, it’s probably best not to poke it with a large stick.